Frazier President, Carlos P. Oliver addresses attendees at the Dyersburg Plant Ribbon-Cutting. “In May 2017, FRAZIER announced plans to invest $17.4 million to locate new operations in Dyer County and create 120 new jobs, and it is great news that this company is ready to start production at its new facility. I look forward to seeing this company continue to grow and succeed in our state,” said TNECD Commisioner Bob Rolfe. Frazier’s Dyersburg Plant is officially welcomed to the greater Dyersburg community. 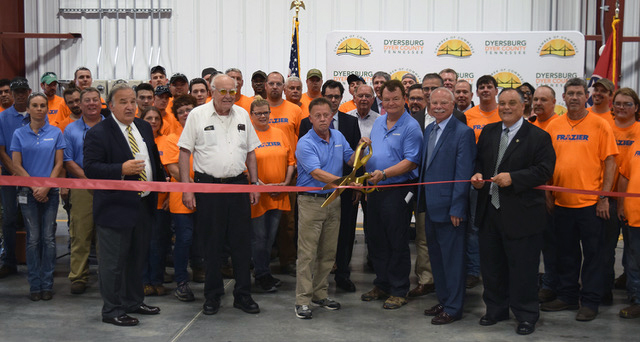 The Dyersburg facility joins nine additional plants across the United States, Canada and Mexico as part of FRAZIER’s Flexible Manufacturing Network. The accredited industry leader in structural steel racking since 1949, FRAZIER boasts the greatest production capacity in the industry. 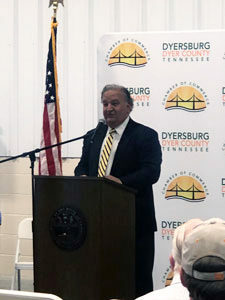 Dyersburg will be a key contributor in FRAZIER’s ongoing initiative to revolutionize warehousing storage, as the world currently knows it. “[Manufacturing] diversity gives both our citizens and new residents ample opportunities for gainful employment with stable, well-respected industries. FRAZIER Industrial serves to strengthen our local manufacturing base, and we are proud to partner with such an outstanding American company,” stated Dyer County Mayor Chris Young. To learn more about FRAZIER, please visit us at www.frazier.com or connect with us on Facebook, Twitter and LinkedIn.